Captain James Tiberius Kirk. You know the man, the legendary captain of the starship Enterprise. His record is impressive and that's just the women he's taken to bed. 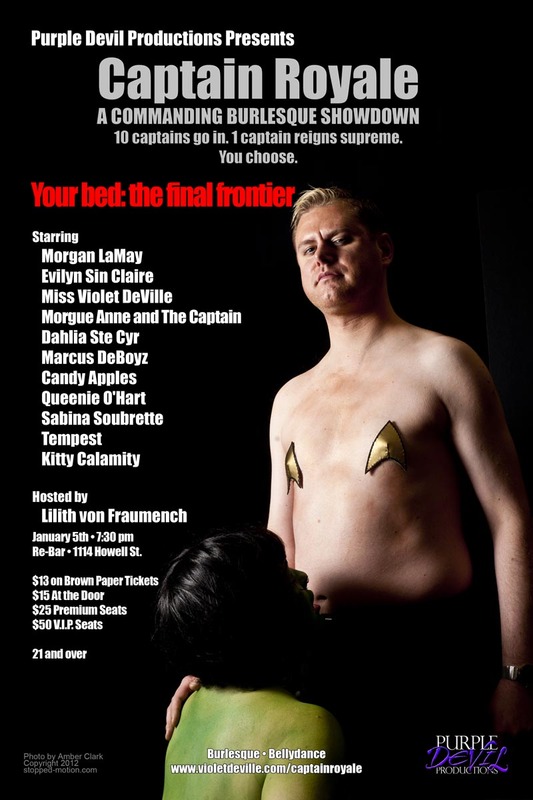 Opposing him in Captain Royale: A Commanding Burlesque Showdown is Captain Kathryn Janeway, another Starfleet officer and captain of the starship Voyager. Captain Janeway is known for being a straight laced, by the numbers kind of woman who cares deeply for her crew. Kirk will show you what you do with an Orion slave girl while Janeway will let that tight bun of hers down. Dahlia Ste. Cys and Marcus DeBoyz will throw down with Miss Candy Apples this Saturday at the Re-Bar for Captain Royale. Which one will you choose? Ten captains. One reigns supreme. You choose. Updated: Stopped Motion Photography has set up a donation button through PayPal if you cannot attend the show but still want to help. We've added the button at the bottom of the page. On July 30th, my oldest niece, Christy, was driving on U.S. Highway 287 just north of the Colorado-Wyoming border where she hit a patch of wet road after a summer storm. Her Dodge Neon hydroplaned and crossed into oncoming traffic, sliding into a semi. Her injuries were severe enough that she was air lifted to Denver Health for treatment in Colorado. She is out of the ICU now and in rehabilitation for her severe brain injuries. She still has a long way to go. Christy wanted to come to Seattle and explore the independent music scene and this thing called burlesque that her crazy aunt did. With five weeks in the intensive care unit and ongoing treatment at a hospital specialized in the rehabilitation of brain injuries, her medical bills are going to be staggering. Go see a burlesque show. Blithe Nite, Candy Apples, Cinder, Dahlia Ste. 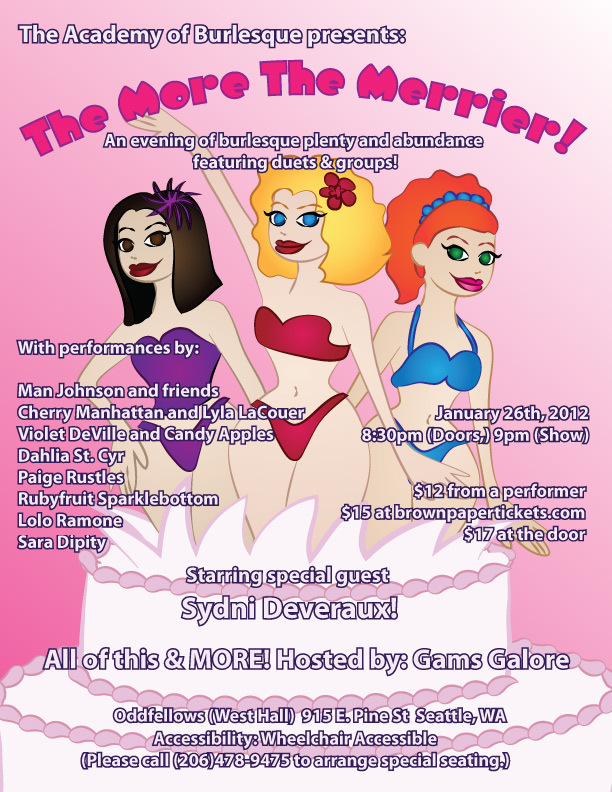 Cyr, Jen Cerdena, Karmen Sutra, Pidgeon Von Tramp, Sara Dipity, Sgt. Die Wies, Solange Corbeau, and Tootsie Spangles. The evening will be hosted by the amazing Empe ROAR Fabulous! General Admission Tickets are just $15 at the door, $13 on Brown Paper Tickets. Online Ticket Sales are at titsforchristy.bpt.me. Proceeds go to help cover the costs of her continuing treatment. This show is for her. If you cannot make it to the show but still wish to donate to the cause, please use this button courtesy of PayPal and Stopped Motion Photography. 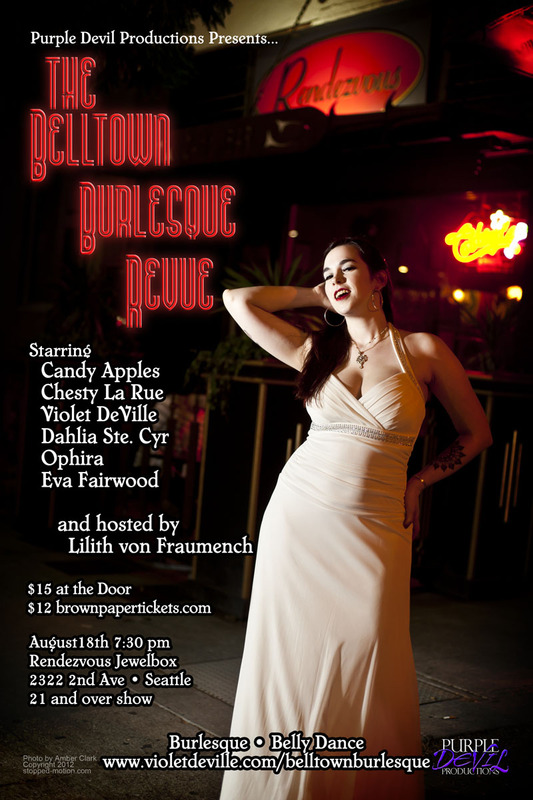 Belltown Burlesque Revue for August! The dog days of summer are here and it's only going to hotter before it cools off! I'm not just talking about the summer days. Not at all, I mean to say this show is going to heat you up before the night is over. This evening of bumping and grinding is the perfect accent to your summer night whether your evening is just beginning or coming to an end. 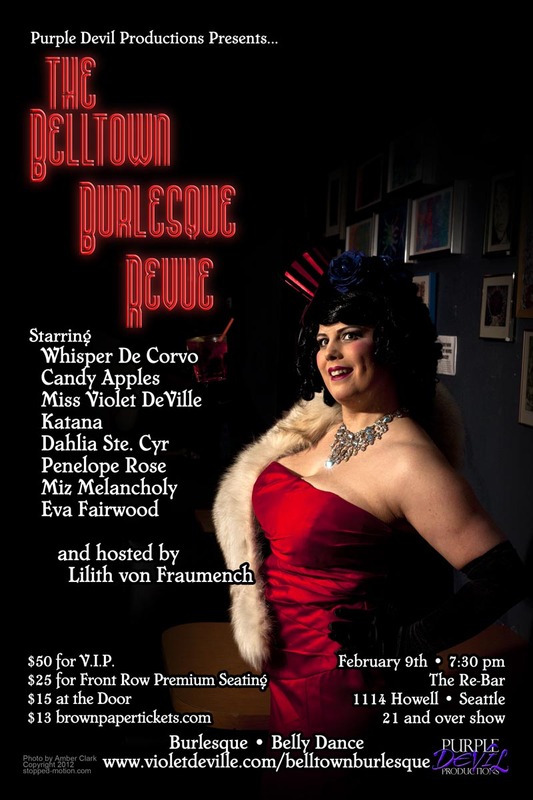 The Belltown Burlesque Revue is back and do we have a show for you! 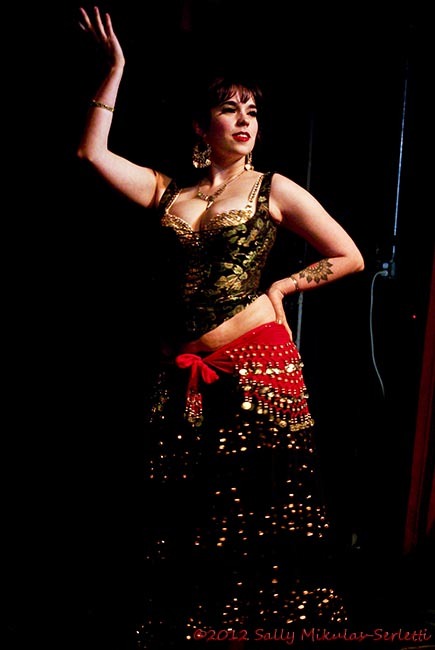 The Belltown Burlesque Revue is August 18th at the Rendezvous Jewelbox located in Seattle's historic Belltown neighborhood. 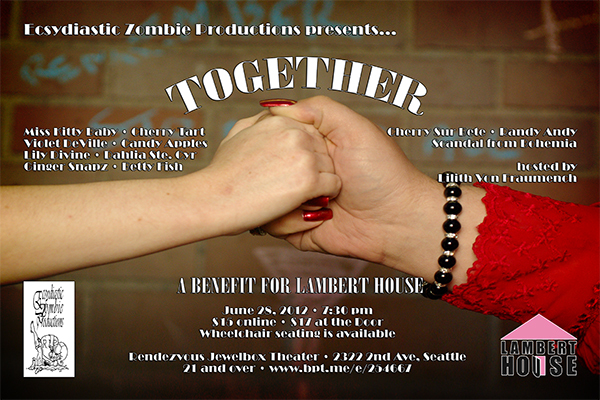 Together: A Benefit Show for Lambert House in two days! Do you want to help a good cause? Do you want to be entertained? Do you like burlesque? If you answered yes to any of those questions, then I have a deal for you! June is the month of Pride and it's that time of year where we celebrate the diversity of our communities and the strength of our unity. Join us in our celebration of what it means to be a part of the LGBT community and you are welcome to join us whether you're queer or not. Let's join together and celebrate the next generation of LGBTQ youth. Lambert House is a local center for lesbian, gay, bisexual, transgender, and questioning youth that encourages empowerment through the development of leadership, social, and life skills. Along with many other services, Lambert House hosts a drop-in center for LGBTQ youth that is open from 4:00 pm-9:30 pm, Monday-Friday. Finding community like this when you're growing up is invaluable. Proceeds from the show will benefit Lambert House, and the fabulous work that they do. More information and tickets at Brown Paper Tickets and on Facebook!